(Nanowerk Spotlight) Battery technology is advancing on two fronts, reflecting in increased specific energy for longer runtimes and improved specific power for high-current load requirements. Improving one characteristic of a battery may not automatically strengthen the other and there is often a compromise. 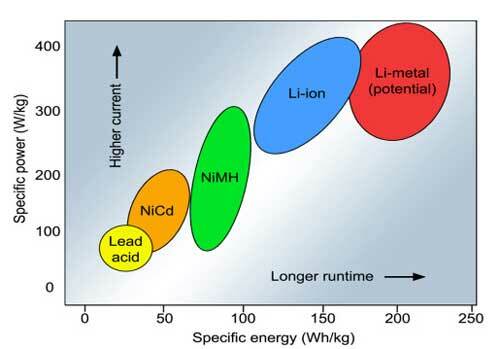 Lithium is regarded as a vastly superior electrode material due to its capacity (3860 mA•h•g-1) and the lowest negative electrochemical potential (-3.040 V vs. the standard hydrogen electrode). Today, the best performing battery in terms of specific energy and specific power is the secondary lithium-metal (Li-metal). However, uncontrolled dendrite growth during Li depositing/stripping in rechargeable Li metal based batteries has prevented their practical applications over the past 40 years. In our Nanowerk Spotlight from a couple of weeks ago, we addressed the issue of growth of lithium dendrites and its negative impact on the performance of lithium metal-based batteries ("Graphene renders low local current density to inhibit growth of lithium dendrites"). The above-mentioned approach, introduced by the research group of Dr. Qiang Zhang at Tsinghua University in Beijing, is based on graphene. In new work, Zhang's team has now proposed a novel method of modulating the lithium ion adsorption to suppress lithium dendrite growth by employing glass fiber (GFs) as solid electrolytes with plenty of polar functional groups as the interlayer between Li metal anode and routine polymer separator. "Polar functional groups of glass fibers strongly adsorb lithium ions to compensate the electrostatic interactions and the concentration diffusion between lithium ions and protuberances of routine anode," Zhang explains to Nanowerk. "This effectively prevents the accumulation of lithium ions around protuberances." The results have been published in Advanced Materials on April 20, 2016 ("Dendrite-Free Lithium Deposition Induced by Uniformly Distributed Lithium Ions for Efficient Lithium Metal Batteries"). The molecular simulations carried out by the team indicate that an elevated binding energy of 3.99 eV is generated between SiO2 and Li relative to 2.85 eV for Cu and Li. The finite element method confirmed the evenly distributed Li ions caused by extra 1.14 eV. 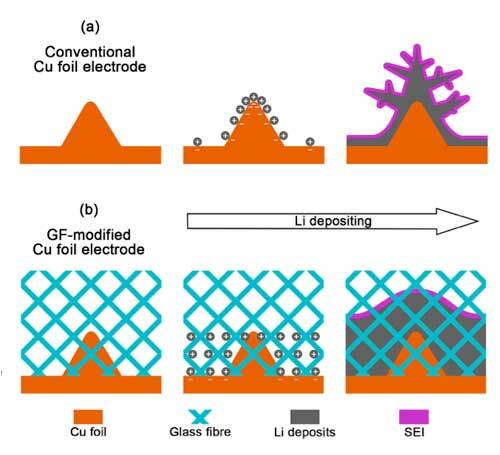 "After the electrochemical tests, large dendrites with a diameter of 5.0 µm and lengths of 20~40 µm formed on the conventional Cu foil current collector," notes Xin-Bing Cheng, the paper's first author. "In contrast, we obtained a dendrite-free morphology on anodes that were modified with glass fibers." The team showed that the dendrite-free morphology led to an enhancement in Coulombic efficiency. Under the current density of 0.5, 1.0, 2.0, 5.0, and 10.0 mA cm-2, GF-modified cells deliver enhanced Coulombic efficiencies of 98, 97, 96, 93, and 91%, respectively. "The surface polarity modification affords a creative method to inhibit dendrite growth by molecular interactions," Zhang says. "However, we still don't know the exact dynamics of Li ion adsorption and Li ion diffusion before and after Li ion adsorption are still unknown." In conclusion, this work shows that the use of polar solid electrolyte efficiently and effectively tunes the Li ion distribution and achieves evenly distributed Li ions to inhibit dendrite growth. These results shed new light not only on Li metal-based batteries, but also on Na, Mg, and Zn based batteries for advanced energy storage.